Anyway with all these holes in all these jeans I get a big pile of 'fix me' items that stack up in my sewing closet. But lucky for you and my limited time to get things done, I have perfected patching these types of things without having an annoying patch on the outside. Turn them inside out and lay them as flat as possible . Wal-Mart and craft/sewing stores sell these awesome iron on patches. I got a big package with a ton of different colors and styles. If it's not the perfect color, that's okay because you don't really see whats underneath so much anyway. Put the patch into place, making sure to cover the entire hole.. Then iron into place as good as you possibly can. Smaller pants are a little bit harder than adult size but it is doable! You just have to move the pants around and be patient! When you are done sewing the inside of the pants will look something like this. 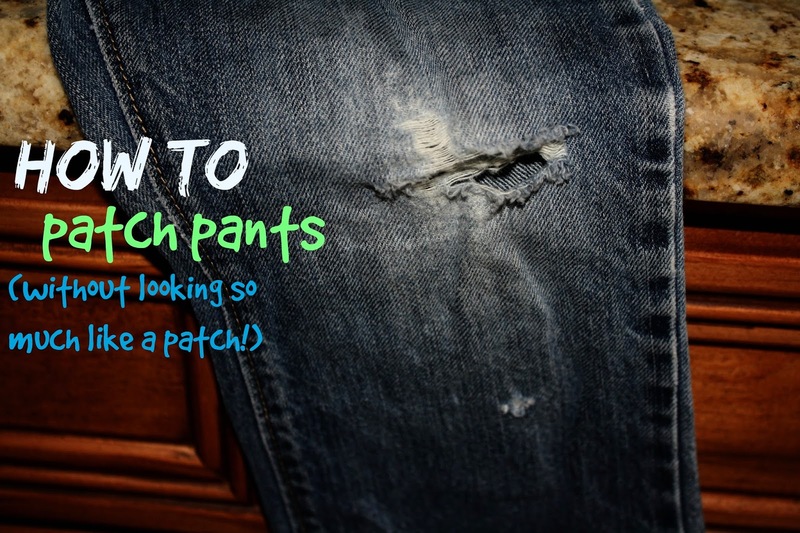 The iron on patch is not a forever thing and will usually wash away the adhesive within a few washes. Really its only there to keep a clean line and make it easier for the sewing process so I will try to life up edges and trim close to where I've sewn. This has definitley extended the life our our jeans, especially when we're about to go from winter to spring and I dont want to fork out the money for jeans they are only going to wear a couple times! Happy Sewing! !